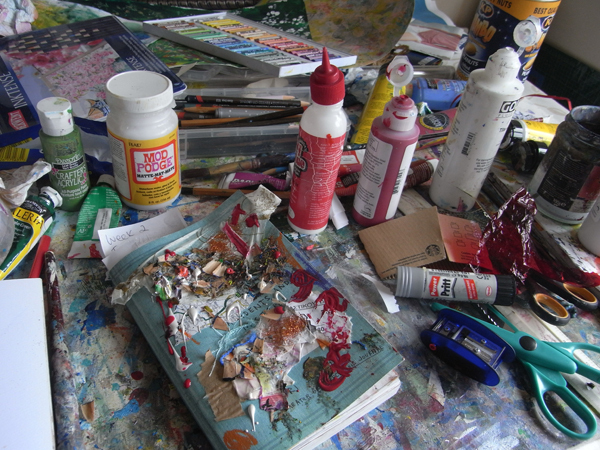 OK, I admit it - I am a rather messy person (understatement of both this century and last). It wasn't always this way. I blame my Muse. Ever since she started showing up on a regular basis, we've lived in a state of perpetual confusion. Believe it or not, there is actually a dining table underneath all that clutter and I did not stage the photograph! The top picture shows the cover of the book slowly disappearing. The page I ripped out is under the glitter﻿. I have certainly found it easier this week to be much less conservative and possessive over my journal. Working with you all in the Facebook Group and encouraging you to take your expression to the next level has helped with my own - after all, I do have to practice what I preach! I hope you aren't finding me too bossy and take the suggestions in the spirit with which they are intended! It seems that way ... I have just read that Kristin has been flashing the neighbours while stomping over her book in the mud and rain which is just what I wanted to hear! As I said on Facebook, being labelled the neighbourhood eccentric is a added bonus of this book group. No need to thank me... all part of the service! I am open to suggestion how we do things each week. Right now it looks as if we're all having fun and beginning to learn to experiment. Would you like to all try a specific exercise together each week? Do feel free to make your own suggestions. 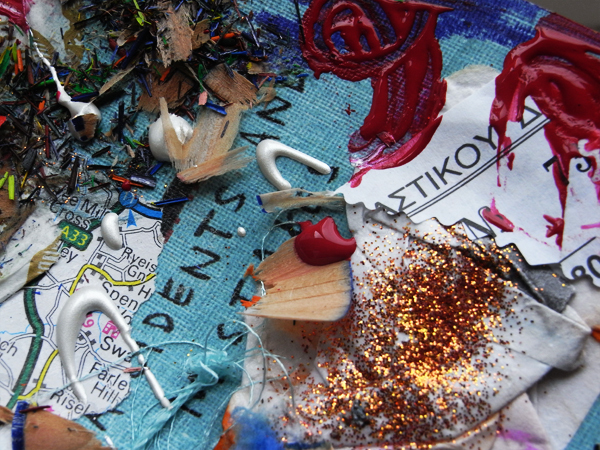 I think this week has been a timely reminder that we are playing and experimenting rather than creating something to hang in a gallery. As we look more closely at our own and each other's mess, we'll start to pick up new techniques to try out on the 'real thing'. Jez's blurry daffodil photo is a great example. Remember, you don't have to stick to the book (though I appear to have glued myself to it a few times!!). By all means create your own challenges and experiments then stick pictures of them in the book (if they don't fit themselves) and of course, share them with us! I'm having such fun. 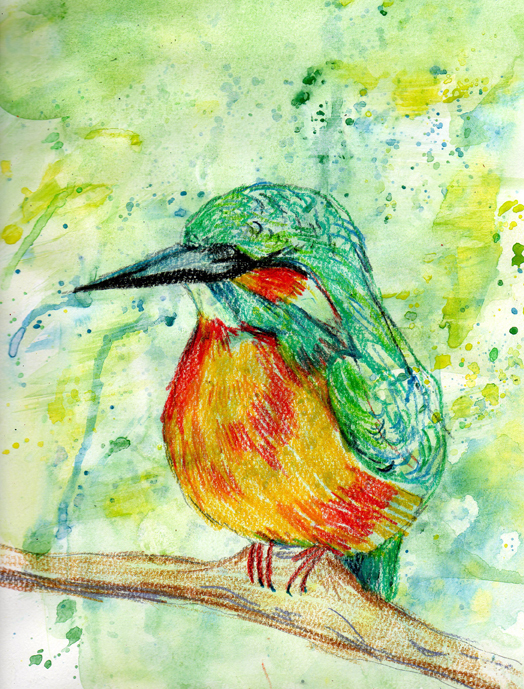 I've just drawn this kingfisher with Inktense pencils on a watercolour background. Rain is forecast so it's going out in the garden all night.... Will report back on what happens. Eek! PS - sorry this post was so late today. Busy with family stuff. Meant to smear BBQ over my journal but forgot - tish! When I am working my dining room table is piled high as well! Love your bird! Love the bird too! Can't wait to see what it looks like after the rain! 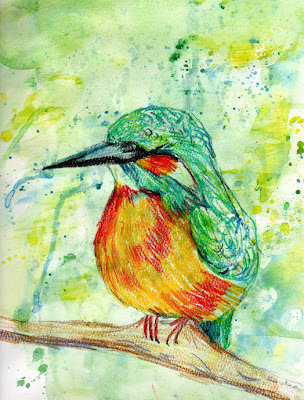 I love the kingfisher too. I wouldn't have thought of using the Inktense pencils for the page I'm going to leave out in the rain - Inktense are my favourite pencils they are so versatile, even more so now with your bird idea. And I'm only joking when I hint that you are cruel to us - I wouldn't be brave and innovative without you. I think the idea of a specific exercise is a good one.